Kaiyodo delivered a masterstroke when they released a Revoltech figure based on Yotsuba Koiwai, the inquisitive lead from Kiyohiko Azuma's excellent Yotsuba&!. The figure is one of my favourites (see my review here), but Kaiyodo didn't stop with that, they made a limited edition figure to accompany it! most schoolgirl anime figures this one looks, well, normal. She doesn't have breasts like balloons or massively revealing clothes, she also doesn't have an extravagant uniform or luxurious long hair. 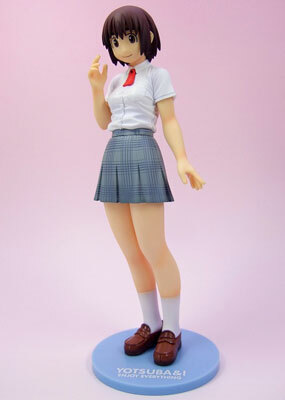 Instead the figure is something rare - a figure of a relatively normal schoolgirl. It's kind of refreshing to get a figure that is a bit more realistic, and it's even more refreshing to find one where the character isn't stick-thin and ample-bosomed. The design and level of detail on the figure is excellent, it really captures the look and feel of the character and the loose-fitting blouse is perfectly sculpted. The painting quality is good and the detail on the face and skirt is done well, with no bleed between colours. It's well made, with the only visible join line being the usual one on the hair, and as a faithful recreation of the manga character the figure is faultless. quite simplistic, particularly on the facial features. Unless you're a fan of Yotsuba&! or own the Yotsuba Revoltech figure, the figure would probably be deemed too dull to take pride of place on your shelf. However, if you own the Yotsuba Revoltech figure, it changes things entirely. The pair look so good together, and the poseability of the Yotsuba figure means that you can combine the two with ease. The pose of the Fuka figure is cleverly done so she looks natural pretty much no matter how you pose the Yotsuba figure around her. You can have Yotsuba holding her hand, riding piggy-back or even just stood next to her and it looks great. Yotsuba adds some colour and the two look exactly like their manga counterparts, which is an impressive feat in itself. Like the Yotsuba Revoltech figure, this one is well designed, well made and just fun. The only problem is it's plainness, which will put non-fans off, but for fans of Yotsuba&! this is a great figure that really evokes the look and feel of the manga. Even though you can't pose it and there are no accessories this is still a great figure and if you have the Yotsuba figure you just have to buy this one too, no question! A stand and a nice box, disappointing.